In the years following the decolonization, Notre-Dame du Nil is the high-school where every young girl in Rwanda dreams of studying: situated on the high peaks of the Congo-Nile region, near the source of the great Egyptian river, the prestigious high-school hosts the daughters of ministers, diplomats and rich businessmen. The students know only too well that they are there only thanks to their family’s wealth and, so, know how much they worth: the main goal of their education is to make them feminine models in the newly-born Rwandan society- feminine, because women have specific roles: the strict religious discipline and the elitist education provided by French and Belgian teachers aim at preserving their virtue and making them ‘good marriage material’. However, beneath this glittering surface of wealth and prestige, guarded by the strict religious morals of Sister Lywine, more earthly things occur, such as the “rewards” given by Father Herménégilde to the worthy students (especially to Frida, the beautiful fair-skinned student). Scandal breaks when Frida becomes engaged to a rich Zairian and soon gets pregnant. Her mysterious death is a shock for the small community and her name is banished from all conversation, like a shameful memory. 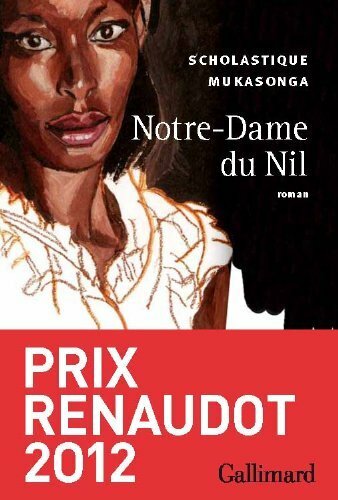 Awarded the 2012 Renaudot Prize in France, Notre-Dame du Nil represents a powerful and almost merciless piece of writing about post-colonial Rwanda; a small mirror into a society in which wealth, prestige and strict rules can only increase tensions and passions. The novel can be seen as a kaleidoscope of portraits depicted in a meticulous way: Gloriosa, an arrogant Tutsi looking down on the others, Frida, the beautiful victim, Virginia the courageous who wants to know more about her ancestry. The most eccentric figure in the novel is perhaps Monsieur de Fontenaille, a White anthropologist who preaches the superiority of the Tutsi people. It is through his predictions and theories that Mukasonga lets us foresee the genocide to come, after all, Notre-Dame du Nil only allows 10% of Tutsi students. In this selective microcosm where many things are silenced, ethnic tensions come to life and are about to burst at any time.